We’ve all seen the promos for the TLC show “Hoarders” where we see every day people surrounded by mountains and mountains of stuff; Stuff that an outside observer would label as junk. However, what many don’t understand is that the impulse to hoard is not because someone is lazy or slovenly. The reason people compulsively hoard is because of memories. It could begin simply with movie ticket stubs, pictures, and cards. It can quickly escalate with keeping things that were free, gifts or items and clothing that “might be used some day”, gifts they intend to give eventually, etc. 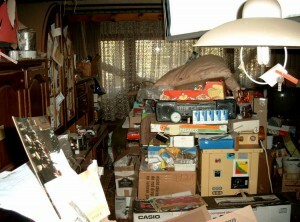 Hoarders typically morph into agoraphobics because of the lack of understanding surrounding their condition. Out of fear and embarrassment, they stop letting family and friends visit, no longer call maintenance professionals and keep their blinds closed in order to avoid lengthy arguments about the clutter. Eventually, hoarders end up feeling isolated and depressed about the clutter but are paralyzed. Throwing things out is not a simple thing for there is now an emotional attachment. Everything in that apartment or house can be explained, and justified whether or not the rationalization seems logical to you or I.
Hypnosis is a valid and wise treatment plan for a person suffering from Compulsive Hoarding. It can help them understand that what you are throwing out, or donating is not the memory surrounding the item. For example, the bear your husband won for you on your first date at a carnival 30 years ago is falling apart and collecting dust. If you throw it out you won’t forget that night. You won’t forget the feelings you had when he first gave it to you. You won’t forget your first kiss, or the first time you held hands because that’s all in your mind, not sitting on a shelf taking up room in your apartment. There is a difference between being sentimental and a hoarder of course however, the line must be drawn and with hypnosis, I can help show you where it is. So, get up, find your phone, and give my office a call. This entry was posted in addiction nyc, depression chronic, hypnosis anxiety and tagged anxiety, depression, hoarding by Dr. Errol Gluck. Bookmark the permalink.